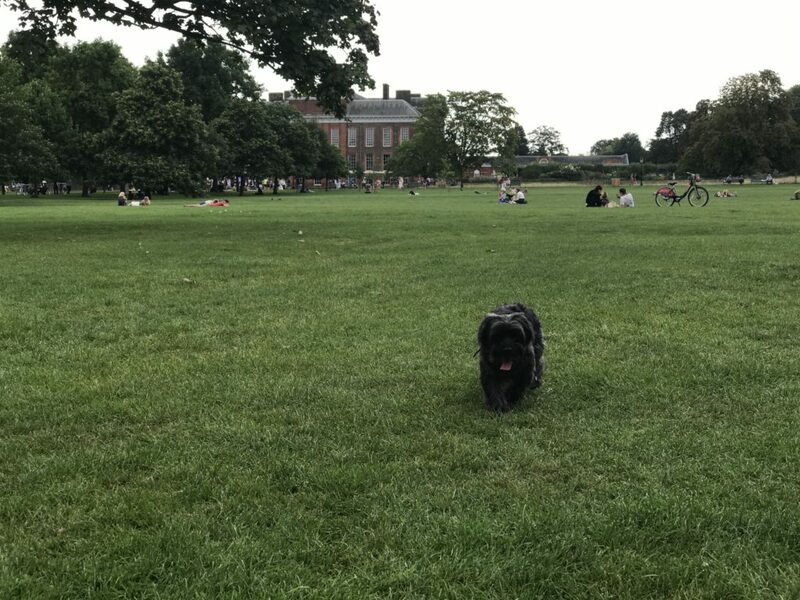 Running around on the green in front of Kensington Palace in the last few days, we noticed people gathering in front of the palace gates. 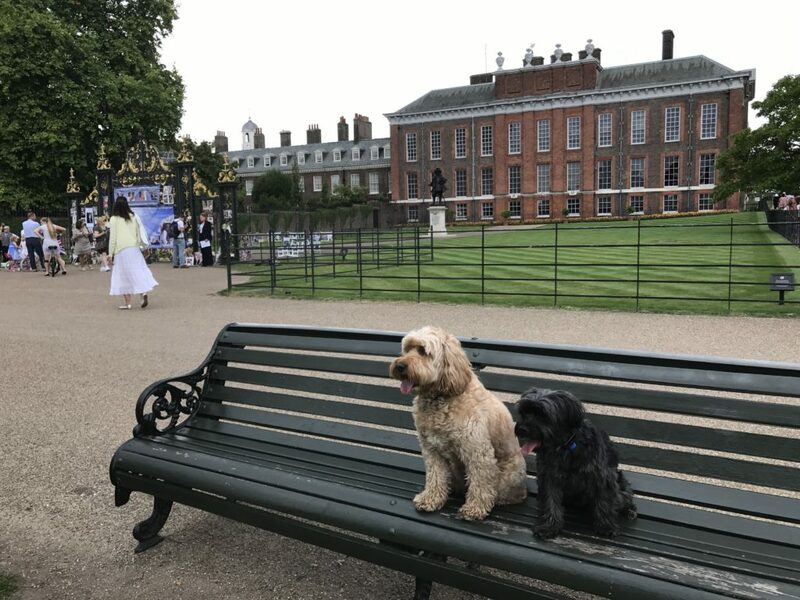 Yesterday, Mummy took us up to the gates to look for ourselves what was happening. 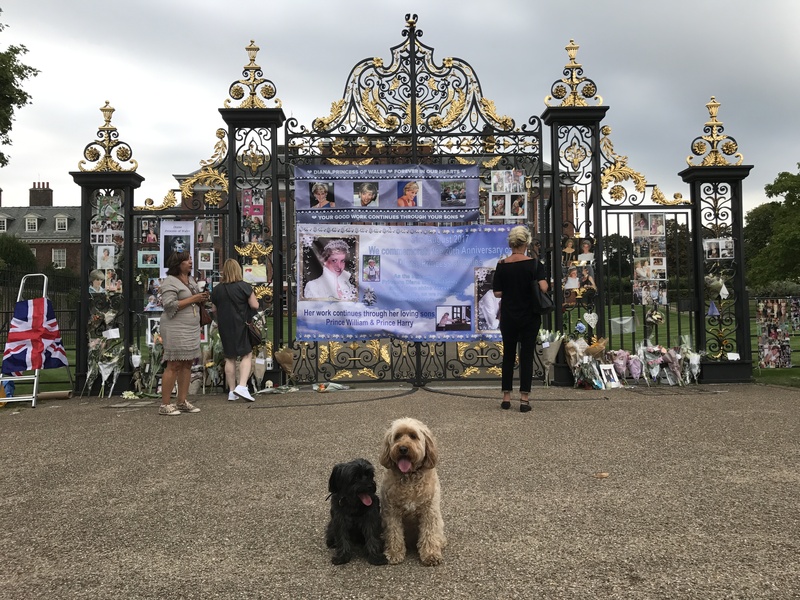 Hoomans had come to remember the anniversary of Princess Diana’s passing. 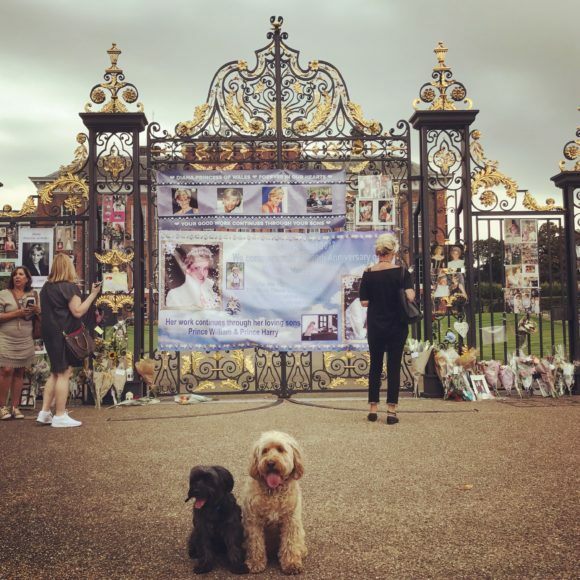 There in front of the palace gates were bunches of flowers And lots of posters and pictures of the princess who died twenty years ago. Mummy told us that news of her sudden death came as a shock to many, many people around the world. 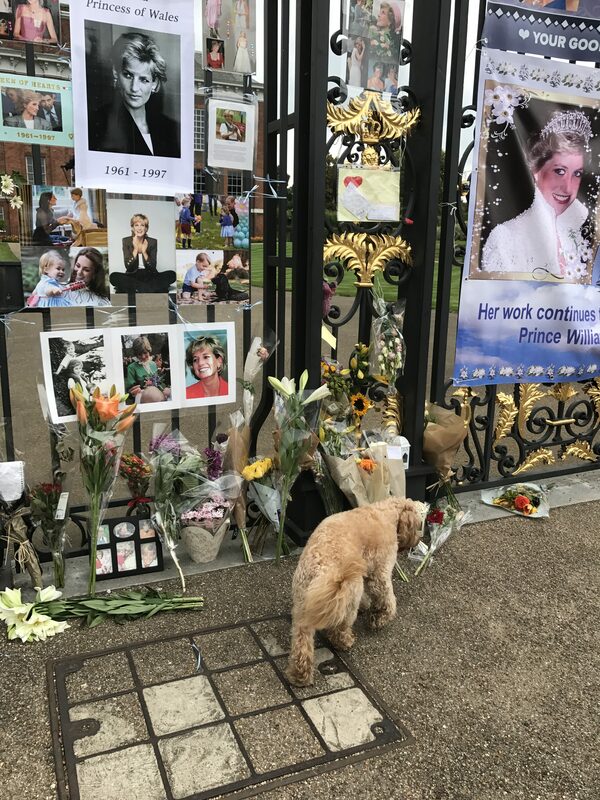 And where we stood yesterday in front of the palace gates was once flooded with a vast sea of flowers, candles and tributes to her. Twenty years later, people still remember their People’s Princess. May’s comment: I remember exactly where I was when I first heard the news. On a business trip in Hong Kong, I was staying over the weekend at the Grand Hyatt. 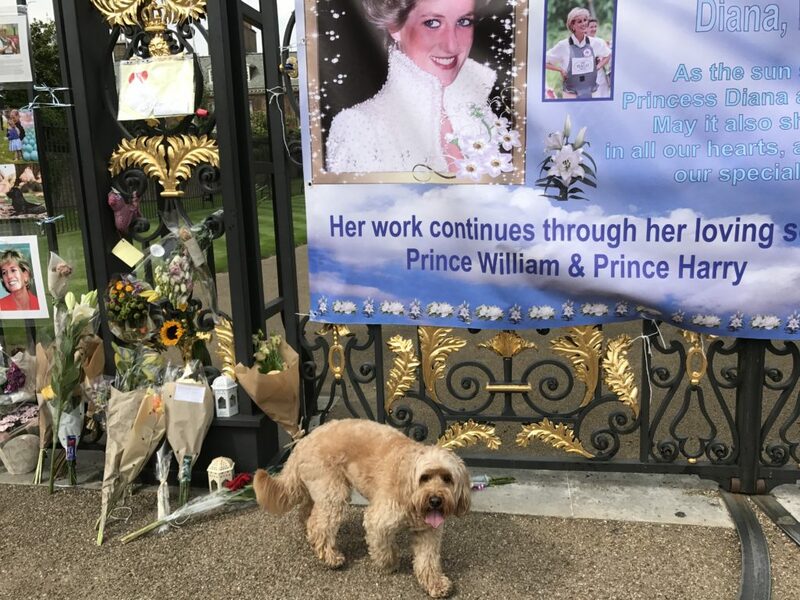 The concierge who knew I was from London came over as I was settling down to have breakfast in the Club room and asked if I had heard the news – that Princess Diana had died in a car crash. Stunned by the extraordinary string of words, I managed a quick cup of tea and returned to my room, switched on the TV to watch the news unfold across all the channels. I was still travelling the rest of that week when events unfolded back in Britain. On the day of her funeral, I had just arrived at JFK airport. The event was televised throughout the terminal. Passengers who had just claimed their luggage did not rush out of the terminal, others with tickets in their hands paused and watched collectively in silence. No one spoke. When I arrived at the place I was staying, the television was on. With my friends, we watched the funeral around a large screen in Manhattan. I remember the announcement of her death very well as I do with the announcement of JFK’s death in 1963. I was watching TV with friends in a Hamptons house in 1997. I and everyone was shocked and sad. One person oddly said it was an assassination. I also recall watching her funeral and listening to the music in 1997 here in Manhattan. Nice to know that she is very remembered 20 years later. So sad. I remember switching the TV on and then walking into the kitchen. I honestly thought I’d misheard when the announcer said Diana Princess of Wales had died in a car crash in Paris. I raced back into the lounge room, and sat there quite numb for over an hour as the story unfolded. I kept tearing up while watching William’s wedding, I kept thinking his mum should have been there to see him married. She’d have been so proud.